Maria will be you hostess during your stay. She welcomes you and help you with any questions and wishes you may have. During low-season she also works as a consultant within fashion and decoration. She loves to help you out and hopes that you will feel like home. Ola is, of course, available for questions and help but during the week he commutes to Copenhagen where he works in the bank industry. He loves the quiet weekends in the countryside. We also have two boys, 5,5 and 7 years old, who are happy to show any children that visits us the best trees to climb in. They are also happy to lend their toys and bicycles to your children. 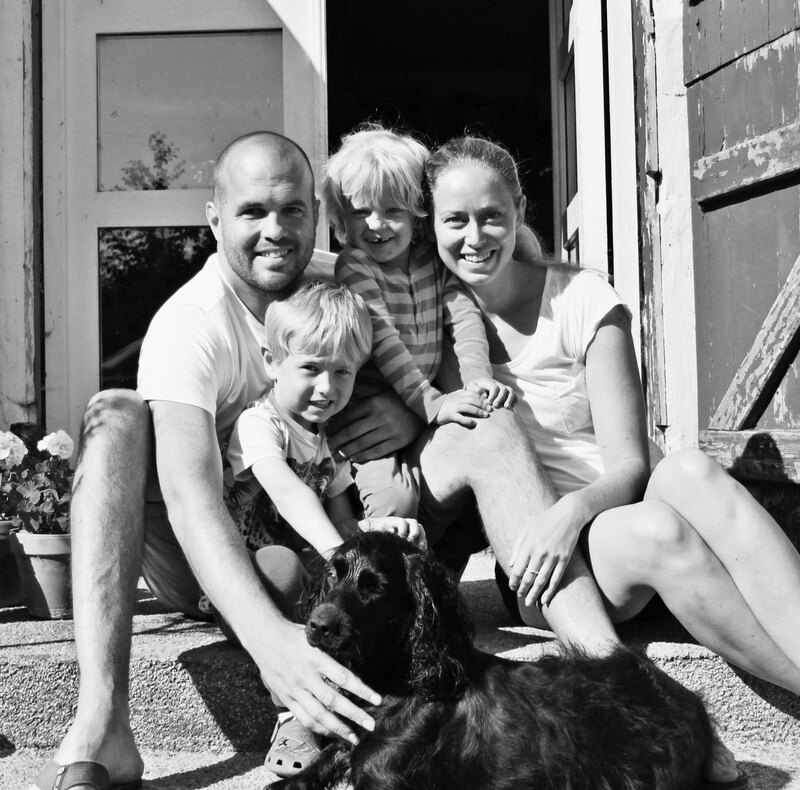 Ola, Maria, Oscar, Sigge and the dog Molly lives in the old stables on this 19th century farm only 400m from the white sandy beach. It is Maria who runs the accommodation and communicates with our guests. She is here almost every day in high-season and is more than happy to help you to make your stay a wonderful one. We moved to the farm 2010 and started renovations straight away. You will never be done with such an old property but we are close to getting it as we want it to be. Ängagården is the old farm in the area and not too long ago the land up to the fields and down to the sea belonged to the farm. During the years different owners have sold pieces of land and today we have a plot that is 2500 sq. The farm has had horses, cows and pigs but it has also belonged to fishermen that had the nets in the old stable. In the 30’s or 40’s the farmhouse burnt down almost entirely. The stables have also been used as a venue but today it is our home. If you have any connection to our wonderful farm, please contact us! Please leave a rating and comments about us on tripadvisor. We are new here but have a rating of 100% which we are very happy about. We are a family who does not judge. Everyone is welcome here no matter how you look or what sexual orientation you have. Our grade on booking sites is currently 9,4 out of 10. We are very prod of our fantastic recommendations. Please read more under testimonials. Contact us to book you stay! The summermonths as well as christmas and new years are filled quickly so do not wait too long to make your reservation. Book by contacting us on info@lillaangagarden.se or call +46 410-25878.